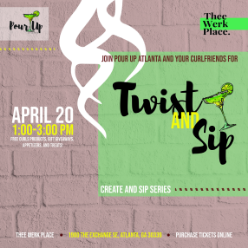 Twist & Sip with Pour Up Atlanta! We are excited to create a safe space for women (and men!) to Create and Sip with each other, featuring major and local small businesses alike. This month, join CURLS and Pour Up Atlanta for a hands-on DIY beauty event that will guide you in how to make your own healthy hair and body butter from the comfort of your own home! You'll learn how to make a smooth whipped shea butter moisturizer using all natural ingredients. There is a 'no alcohol' ticket available for those who do not wish to indulge! We are excited to create a safe space for women (and men!) to Create and Sip with each other, featuring major and local small businesses alike. This month, join CURLS and Pour Up Atlanta for a hands-on DIY beauty event that will guide you in how to make your own healthy hair and body butter from the comfort of your own home! You'll learn how to make a smooth whipped shea butter moisturizer using all natural ingredients. General Admission Ticket Includes: Open Bar (Mimosas, Sangria, Margaritas) Horderves (Mac n' Cheese Bar) DIY Whipped Shea Butter Materials and Container There is a 'no alcohol' ticket available for those who do not wish to indulge!